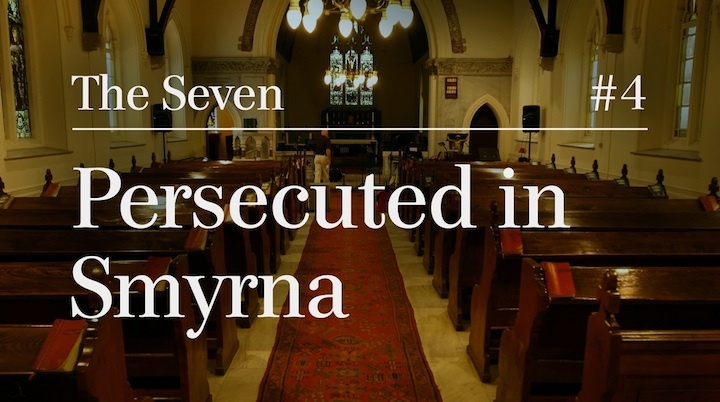 The Church in Smyrna is one of the most often overlooked churches of the seven specifically mentioned in Revelation. We don’t have to look very hard to discover the reason why. Of the seven churches Jesus specifically addresses, only two of them are not condemned through his message. Those Churches are located in Smyrna and Philadelphia respectively. While Christ sends no condemnation to either church, he does deliver bad news to one. The church that receives this bad news is the Church in Smyrna, also known as ¨the suffering church.” NOBODY wants to be this church. Even through good news of our obedience, the message of suffering is one that we easily will skip over and hope the message is for someone else. But, if we skip over this particular church, we will miss the amazing promise that Jesus has for us. This promise shines brightly even through the times of the most intense suffering. Just as in any letter in ancient times, the sender announces who he is. Jesus provides us with a bold declaration. When Jesus declares, we don’t simply see who He is, but also what He means to us. We have a tendency to race through our Bibles as if we are reading a magazine article. Take a moment. Really think about this passage. Christ is declaring that he indeed was here first, and in addition, he is the last. Even more, Jesus is alluding back to the Old Testament to show us His supremacy (Isaiah 44:6). Jesus could rightly stop there, but he paints an even brighter picture for us to see who he is. He is the one that died AND came back to life. Jesus effectively draws a line in the sand for every human to see. There were other gods, but there is only one God. We now have a portrait of the God that is and always has been. Even more outstanding than his eternal existence for us is that He came down and died but did not stop there. He came back to life! As Christians, this is well known. In fact, for a church like Smyrna they knew this for a fact. They held this in their hearts and their actions in daily life were based upon this very knowledge of who their Savior was and what He had done. But Smyrna, just like us, needed this reminder in order to endure the fire they were about to walk through. For a very long time, most US presidents held one common characteristic. The men that ran the country has all served in the military. These leaders that set policy and motivated the nation had all been under fire. They had seen death, combat, and had put their lives on the line in some capacity. In a similar way, Jesus tells us to remember that He has seen suffering (Hebrews 12:2-3). Jesus is God. Jesus is a God that can empathize with His children and their suffering. The key to understanding God’s message through this particular church to us is to look at the name. Smyrna is a Greek word. It is a translation of a word that might be more familiar to you- myrrh. Myrrh had two uses. First, it was used as a perfume for the living. We see this in Matthew 2:11 when myrrh is one of the gifts delivered to Jesus. The other common use for myrrh was as a perfume for the dead (John 19:39). Myrrh form part of small bookends on the life of Christ on this Earth. In a similar way, you can see this for the Church in Smyrna. Myrrh was produced in a very interesting way. Taking a fragrant plant, they would crush it and it would yeild a sweet fragrance. As you continue through Revelation 2:9-10, Jesus announces that some crushing was about to ensue. There would be a short, but intense fire that this church would walk through. We walk through life much like a tube of toothpaste. On the outside of the tube, it says Christian. When its squeezed, what comes out? For the Church in Smyrna, they would face the most intense persecution and pressure they would ever face- their response would be the sweet, fragrant smell of the Savior. Jesus was confident in this result. He was confident because of what they had shown Him already. Smyrna was a city rife with pagan worship. Christians in this community were seen as antisocial elitists because they refused to take part in the pagan worship that was the center piece to this city (sound familiar?). There was a pantheon of gods such as Zeus and Apollo that the city could see and bow down to as well as the intense Roman Emperor worship that wasn’t optional. Each and every day, Christians were faced with a choice. Call Caesar Lord and live, or call Jesus Lord and lose wealth, possessions, or their life. Faced with this reality, most church members were beggars, many were slaves, and almost all were destitute. In a world where we worry about how good the message will be at church, these Christians worried about being alive. Yet, Jesus tells them (and us) that they are rich. The Jesus that had suffered tells them that you are poor, but you are rich in what matters. Each day, I can miss the currency that matters. Words like salvation, holiness, grace, peace, fellowship can all be religious words that roll off my tongue. Or I can realize that these are the traveler’s checks that my Savior has given me as I wander through this world. Jesus closes his letter to Smyrna with a familiar command. He tells them not to be afraid. There is no need for fear in the life of a believer in Christ, because He knows exactly what the future holds for you. As a reward for faithfulness, Jesus promises them a crown of life (also James 1:12). Smyrna was famous for its Olympic style games. The victor of the games would receive a crown to show their victory. Jesus isn’t telling them that they will run the fastest or even have been the strongest. What He does tell Smyrna is they will be victors over death. The city of Smyrna was oblivious to God; who He was and what He would do in the future. The grave is not the end for anyone. There are to destinations from our end here. There is eternal life with Christ and there is the second death (Rev. 20:13-15).